Home > News > What a weekend! British summertime. The great outdoors. The weekend. What could make things even better? Well the Archery GB Big Weekend, for one. And it did at 79 clubs across the UK. Reports are still coming in but we can safely say it has been a huge success. One club, Bowmen of Warfield, pulled in the crowds and finished its event with a full beginners’ course signed up, plus six intensive training course booked and more on the waiting list. You can get a glimpse of what went on at the event here. Mandie Elson, Chairwoman of Newark Castle Archers, was all smiles too. She said: “We had a little boy who is very poorly having a go at archery and to see his smiley face was completely worth all the hard work it took to put it together. 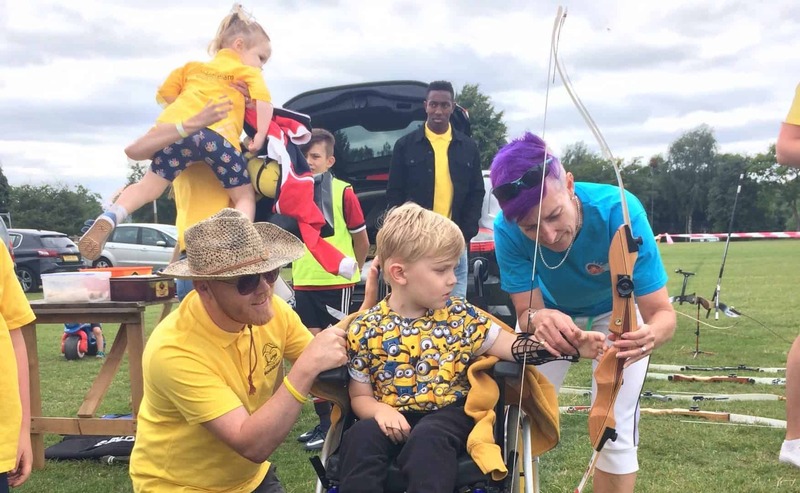 More than 90 people turned up to take part in Kirby Muxloe Archery Club’s Big Weekend – but once they arrived they could not tear themselves away. Club Secretary Lynn Pearson said: “Once people were there they stayed for well over an hour, if not longer, queuing for yet another go at archery. “There was plenty of fun and laughter from everyone, especially youngsters trying to beat dad, to more mature people just pleased they had hit the target. We held a highest score competition and the prize was a free place on the next beginners’ course. We are yet to contact the lucky winner. We had lots of enquiries from people wanting more information about our next beginners’ course in July. We even had a past club member – in his 70s – come and say hello. We tempted him to have a go and, despite being a little hesitant at first, he soon got back into his shooting stride, so much so he is rejoining the club after a seven-year gap and stayed and help pack away the equipment! Guildford Archery Club attracted 200 visitors. People were eager to have more than one go and it resulted in nine beginners’ course bookings and one membership enquiry. Above: Newark Castle Archers in action.